What PCI interface is needed for DVI2USB 3.0? DVI2USB 3.0 is compatible with both a USB 2.0 and a USB 3.0 (SuperSpeed) USB interface. Note that performance, when in USB 2.0 mode, can be reduced. How can I verify whether my system has USB 3.0? USB 3.0, also known as SuperSpeed, comes standard on all computers manufactured after 2011. Check with your computer or motherboard manufacturer to verify that USB 3.0 is present on your system. How many frames per second can DVI2USB 3.0 capture? It depends on the resolution of your screen, the screen refresh rate, your operating system and the speed of the computer that is capturing images. Consult Specifications for appropriate capture rates. Does DVI2USB 3.0 reduce the resolution of the images it captures in order to transfer it over the PCIe bus? No. DVI2USB 3.0 captures and transfers every pixel of the original frame in RGB24 format. In this respect, DVI2USB 3.0 provides better quality than a DVI-to-video converter paired with a Composite or S-Video grabber. Can DVI2USB 3.0 work on Windows NT, Windows 3.x/95/98/SE/ME/2000? No. Unfortunately, some of these systems have poor support or no support at all for USB 3.0. The video mode that I am using is not listed in the list of supported modes for DVI2USB 3.0. Can DVI2USB 3.0 capture it? Yes. You may add custom modes through the DVI2USB 3.0 software, available as a free download. What Linux kernel does DVI2USB 3.0 support? The Linux drivers are available. Please contact us before you purchase if you require a driver compiled for a specific kernel version or kernel setting. Can DVI2USB 3.0 save captured signals as a movie? Yes, the DVI2USB 3.0 application has the ability to save captured signals as an AVI file. Which codec works best with DVI2USB 3.0? The choice of codec and codec settings depend on the requirements for the quality of the AVI. You may need to try several codecs with different settings to see which codec best fits your task. DVI2USB 3.0 has an automatic algorithm that crops visible images from the DVI frame. The algorithm may make a mistake, and be off by a few pixels. Please refer to Configuring Image Adjustments in section 18 of the Video Grabber User Guide. Can I connect two or more DVI2USB 3.0 devices to one computer and capture signals simultaneously? 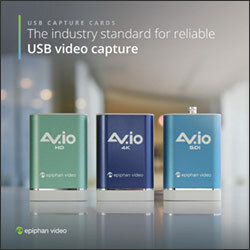 What is the resulting rate of capture for each DVI2USB 3.0? Yes you can connect two or more DVI2USB 3.0 devices and capture multiple signals simultaneously. You will need to run the DVI2USB 3.0 application for each DVI2USB 3.0 device attached. With what software can I interpret the digital signal generated by the DVI2USB 3.0 device? The DVI2USB 3.0 frame grabber works by emulating a high resolution video camera for Windows. DVI2USB 3.0 is a DirectShow compatible device, which means that virtually any video capture software designed for Windows is compatible with DVI2USB 3.0. For example, VirtualDUB can be used to record .avi files, Microsoft Media Encoder to record .wmv files, and RealProducer to record .rm files. DVI2USB 3.0 also supports Video4Linux in Linux operating systems. Does the frame compression on DVI2USB 3.0 hamper the quality of the output? No. DVI2USB 3.0 devices do not use frame compression, resulting in a high quality of the output. Is DVI2USB 3.0 software compatible with Mac OS X? DVI2USB 3.0 is no longer supported on Mac OS. However, you can still download older Mac firmware from the DVI2USB 3.0 download page. Does DVI2USB 3.0 support other inputs such as BNC/component, DisplayPort and Thunderbolt? Yes. DVI2USB 3.0 can capture unencrypted images and video from BNC/component, DisplayPort, Mini DisplayPort, and Thunderbolt outputs. In order to capture video from these formats, the appropriate converter cable must be purchased separately. Epiphan does not guarantee results when using third party cables. 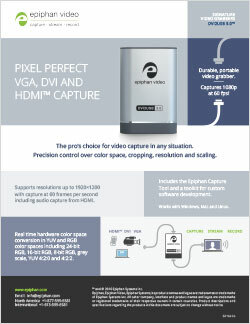 Can I capture HDMI™ with DVI2USB 3.0? Yes. You may capture both the video and audio from an HDMI signal using a HDMI-DVI converter cable, included in the box. Note that DVI2USB 3.0 cannot capture a protected or encrypted HDMI signal. Download version 3.31.0 64 bit Windows 64-bit This package supports DVI2USB 3.0 and SDI2USB 3.0 video grabbers. Includes DirectShow integration. Download version 3.31.0 32 bit Windows 32-bit This package supports DVI2USB 3.0 and SDI2USB 3.0 video grabbers. Includes DirectShow integration. Download version 3.30.3.8 Mac OS X 10.10 – 10.11 QuickTime/CoreMediaIO component and Epiphan capture software. Supports USB 2.0, USB 3.0 and PCIe grabbers, 32-bit and 64-bit kernels. This product is compatible with Linux (i386 and x86_64). 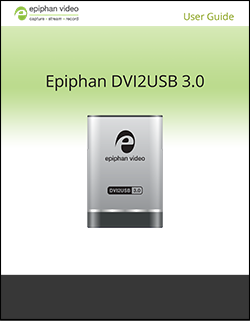 The driver supports V4L (Video4Linux) interface along with specialized interfaces designed by Epiphan. Although we provide a Linux SDK (API for driver and examples), we do not provide source code for the driver itself. We provide binary drivers for major Linux distributions (Fedora, RedHat, CentOS, Ubuntu, Debian, SUSE). Please contact us in advance of purchase to verify that we can support any other kernel or distribution.